Total number of customers who subscribe to at least one of ChannelAdvisor solutions. Starting in 2015 it has remained mostly constant, however Average Revenue Per Customer has continued to increase. 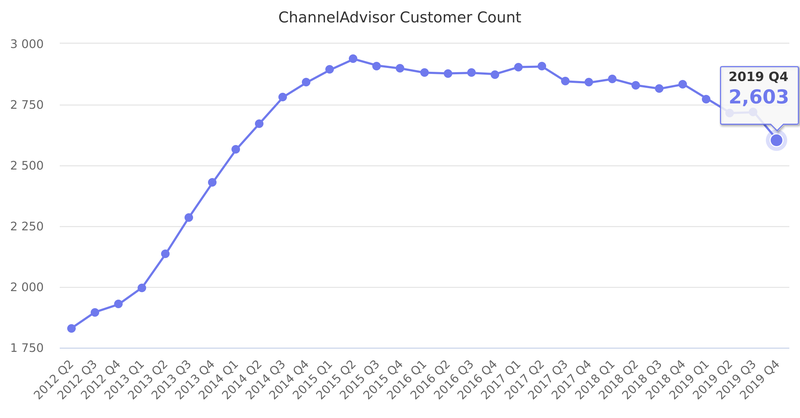 ChannelAdvisor focuses on larger and more profitable customers. "You may notice that consistent with our strategy to focus on larger and more profitable customers and to become more selective with respect to smaller customers, our total customer count did not show sequential increase. In fact, as we focused up market, we believe net ads and customer count alone is no longer an effective way to value at our performance. As they do not sufficiently reflect business activity given the vast differences in customer size we have in our business. To illustrate this point consider that the smallest thousand of our customers, more than a third of customer base by count accounted for only 7% of our revenue in the third quarter. These smaller customers because of their high prophecy to churn yield unfavorable and ultimately unprofitable unit economics. In contrast, our top 100 customers accounted for 26% of revenue in Q3. And we believe it will provide a higher level of profitability due to higher expected lifetime values and lower relative customer acquisition costs." Last reported quarter 2018 Q3 it was 2,815, down by -1% year-over-year from 2,845.